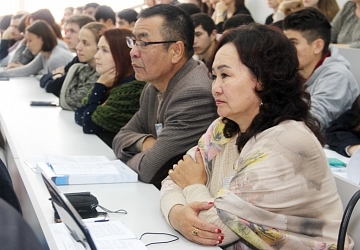 Yesterday, on 27 October 2016, Altai State University hosted the opening of the International Youth Scientific Conference “Ethnocultural and Ethnosocial Processes in Trans-Border Territory of Russia and Central Asia”. The participants include representatives of 9 countries. The conference is dedicated to relevant issues of ethnic, religious, social and political processes that proceed in border territories of Russia and neighbouring states. “The conference pursues two main goals. On the one hand, we are planning to discuss the relevant scientific problems given in the name of our conference. On the other hand, we are going to establish a dialogue between generations, between eminent and young scholars, to exchange experience and research methods. 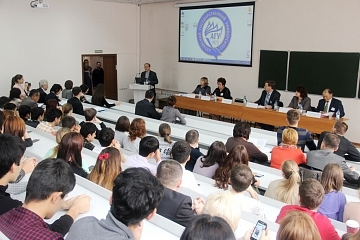 Thereby the youth become familiar with opportunities for carrying out independent interesting research works,” said Professor of the Department of Political History, National and Religious Relations under the Faculty of Mass Communications, Philology and Political Science, Chairman of the Conference Organizing Committee Petr K. Dashkovskiy. More than 120 young scientists from Tajikistan, Uzbekistan, Kyrgyzstan, Kazakhstan, Turkmenistan, Mongolia, Czech Republic, China and Russia deliver their reports in sociology, religious studies, political science, regional studies, history and other fields in the framework of the conference. Such topics as “Interethnic Relations in Trans-Border Territories of Russia”, “Technologies of Color Revolutions through the Example of Kyrgyzstan”, “Migration and Ethnical Policy in Siberia”, “Russian Orthodox Church as an Instrument for Soft Power of Russian in Central Asia” and others are proposed for consideration. It is to be added that the conference is carried out in the framework of ASU Student Associations Development Program for the year 2016. Following the results of the event, the collective volume of materials will be published.